Naples, Italy: In the last few weeks there's been a lot of dicussion about my favorite artist, Michelangelo. First, Italy declared a wooden crucifix of "dubious provenance" to be the work of a young Michelangelo and put up a huge exhibit in Naples. The scholars' debate is passionate, and most say there just isn't enough proof to say that it is work by Michelangelo. For a great roundup of the arguments as well as images of the artwork in question, check out this article from the BBC. Ft. Worth, Texas: Additionally, one of my favorite museums in the US just purchased an early painting by Michelangelo. The Kimbell in Ft. Worth, Texas, paid an undisclosed (read "ginormous") sum for a small painting done by Michelangelo as a teen. 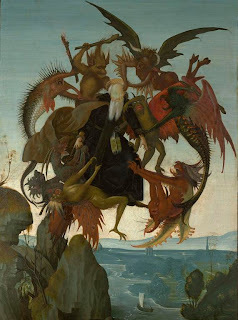 "The Torment of St. Anthony" is one of only a few paintings done by Michelangelo, and it is of particular interest because it was done when he was 12 or 13. It is a copy of another painting which Michelangelo took liberties with and made his own. There is some debate as to whether or not it is a work of Michelangelo, but less debate than about the crucifix in Italy. The painting will be on display at the Metropolitan Museum of Art this summer and then will make its way home to the Kimbell Museum. Read more here! While I'm not with them, there's a whole host of travel bloggers traipsing around Italy this week. 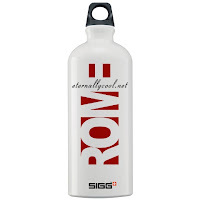 First, congrats to Rome Photo Blog -- chosen as yesterday's Blog of Note! Way to go! Italylogue ran into some men disrobing in Rome and wrote -- complete with some great photos! Miss Expatria discovered one of Rome's fantastic roof-top bars and recommends the pricey prosecco for the view as much as the bubbles. Why did I ask Miss Expatria to take a few of the photos in my latest book? Because she is fab! Check out this photo in Rome as proof. MyMelange has been running around Rome, too, blogging about Vespas, gardens, and her B&B in Rome. EuroCheapo rounded up some fabulous places to listen to live music in Rome -- and all on a budget. Europe a la Carte has a lovely travelogue to one of my favorite churches in Rome: Santa Maria in Trastevere. And if that's not enough Italia for you, Italy Tutto has amassed a list of Italy-related blogs where you can find even more Italophiles. Evidently, @Italylogue has met up with 11 travel bloggers and tweeters thus far on her trip. Follow her adventures on her blog as well as on Twitter. And check out her list of Italy Travel Twitterers to follow, too. Speaking of Twitter, don't forget to enter my Tweet-to-Win contest this week, too! It ends on Friday! That contest is sponsored in part by EternallyCool.net -- one of my favorite Rome blogs. Check them out! CERN, the laboratory in Switzerland, has created a special section on their website devoted to the science in both the book and the film Fascinating! 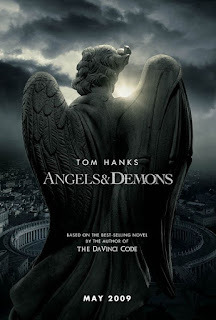 The LA Times Daily Travel and Deal Blog interviewed me about Rome's Angels & Demons, my free ebook about the sites in the book and in the movie. When I was in Korea several years ago, some friends and I got hooked on a tv show called "Fashion 70s." We didn't understand a word, but we totally got what was going on. Well, this week someone sent me the link to Fashion 70s online with English subtitles. Meet my new obsession! I'm blogging about being a student in Rome if you are interested in checking it out! i LOVE your posts. always new stuff to read! thanks. Too bad i did not know about your blog before. i just got back from spending a month in Rome studying Italian with a language school there. I am posting my experiences up on my blog right now. Go and check it out. It is hooked up to my name so it should be easy to find. Richard, so glad you stopped by! From the looks of your blog, you had a great time in Rome. Thanks for connecting.